There are things your cash register just cannot do. But that is not the case with Storyous. See what functions it has and in what ways our team can help you. Did you know that roughly 70 % of new businesses don’t survive the second year of their existence? The reasons vary from not knowing the exact numbers of their business to lacking experience. That is why we develop our POS in cooperation with business owners to help them succeed in the market and stay there for a really long time. Serving customers in the restaurant and outside in the garden, running to the kitchen and charging everybody just in time: waiting tables isn’t easy. Your waiting staff runs around a lot and wastes a lot of time. 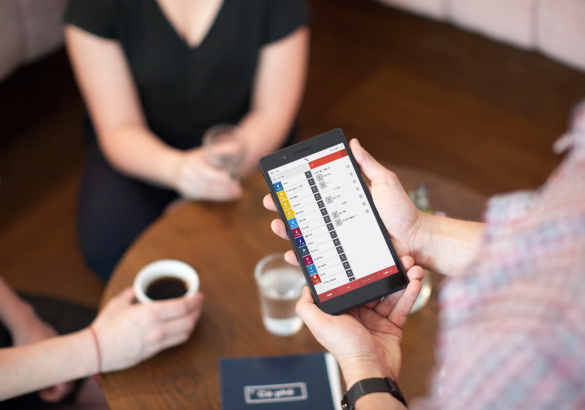 With our mobile waiter, a portable tablet for your employees, it’s a whole new experience. The POS itself will know that there are people sitting at the table for half an hour not being served and it will let you know too. We will print an order number on the bill automatically so nobody is forgotten in the process. It comes handy when selling something to go. Only three clicks to order and it is not necessary to open a new table. It comes handy when selling something to go. You can arrange the tables in your POS according to the actual looks of your business. You can easily transfer any item to another account or to a newly created one. It comes in hand when somebody suddenly changes their seat. You can name every account at your will and then find it by this name any time. Each account can be merged or transferred to some other table. You can easily find all the cancellations in the system and find out who did them. You can also export all the cancellations for a specific period of time. We're ready for the Electronic Registration of Sales (EET). You can upload the certificate that you have from your tax administrator in a jiffy. And at no extra cost. If you want to reward your regular customers and provide them with a one-time discount just choose this option during their payment. You can also choose different price levels, for example when the customer buys something to go. Our system can work with electronic meal vouchers EDENRED, SODEXO, and BENEFITPLUS. It is possible to load your own logo to the system and print it on the bills. You can also print some text of your own on the lower part of it. You can find and print any bill anytime repeatedly. You can split the bill between more customers and everybody can pay for themselves. You just check the specific items for each guest.